The Greatest Fairy Tale of Them All | The Size of a Mustard Seed. Matthew 17:20. Lately I have become obsessed with the BBC show Merlin. It transports me to the time of King Arthur, and the great kingdom of Camelot. The brave and charming knights.The dresses and honor. The chivalry of the men and the gracefulness of the ladies. It is all just so enchanting. There is such a spirit of courage, honor, and faith in this noble world. A spirit of such order and grace that I cannot help but think of the way these societies reflected God. The king was expected to lead with love and strength. He was always to do the best for his kingdom. Most of all, he knew that his place as king meant that, if the time ever came, it was his duty to lay his life down for his people. These among many others, were the noble and honorable ideals of the Medieval kingdoms. Christ was at the focus and center of it all. During the high Medieval period, the Gospel reigned through these worthy ideals. In this, we are given the opportunity to find truly holy people who were surrounded by the charm of this era. 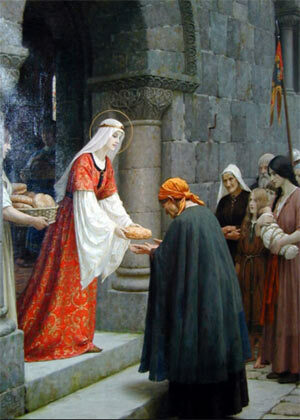 It is here where we meet St. Elizabeth of Hungary. She too was born among the uniformed knights and jeweled castles. Elizabeth was the fair daughter of King Alexander II. This beautiful princess basically lived the most beautiful fairy tale possible. Yes, maybe it was not filled with a knight in shining armor or a midnight kiss, but instead her story contains a “happily ever after” of far greater value. She did what was expected of royalty and at the age of four she was sent to study under the court of the Landgrave of Thuringia. This continued further and was betrothed to Landgrave’s infant son. The time passed and the Princess grew in knowledge, grace, and virtue. In 1221, she married Louis of Thuringia, and assumed her spot in the royal court. This spot in the court did not change the saintly princess though. Instead, she continued to grow in holiness, and handled her position with beautiful poise. The life she lived was a simple one, filled with great penances. Elizabeth found her joy and purpose in serving the poor. She did this out of her great charity, and her husband was a source of great support. Together they had three children, and he would always push his princess to continue to live a life full of devotion and grace. It is said that he was very attracted to her life of simplicity and virtue. Tragedy struck when Louis was killed while fighting int he crusades. Once she was left widowed, Elizabeth made the decision of becoming a third order Franciscan. She arranged for the caring of her children, left the royal court and renounced the world. She knew that her heart was in serving the less fortunate and thus serving God. This was her calling, and with God’s grace she was able to fulfill it. In 1228, she built the Franciscan hospital at Marburg and devoted herself to the care of the sick until her death at the age of 24 in 1231. Let us follow the beautiful example that St. Elizabeth has left for us. She was always focused on one thing alone – loving and serving God. This princess did this in a simple way, among a very enchanting world. It is incredible to see how she adapted her service to God in whatever state of life she was in. She let nothing stand in her way of becoming a saint, but instead took everything, like her position in the court, and viewed it as a blessing. And, when she saw the God was calling her to leave everything for Him, she followed His will for her to serve him. So let us pray for the grace to be like the graceful St. Elizabeth. To always look for the way to serve God. To find all our joy in these actions of charity, and to trust Him in all that He does throughout of life. Let us most of all love God with all our heart, and strive to live a saintly life. Let us live the most enchanting fairy tale of them all, to fall in love with God and live a life totally given to Him.